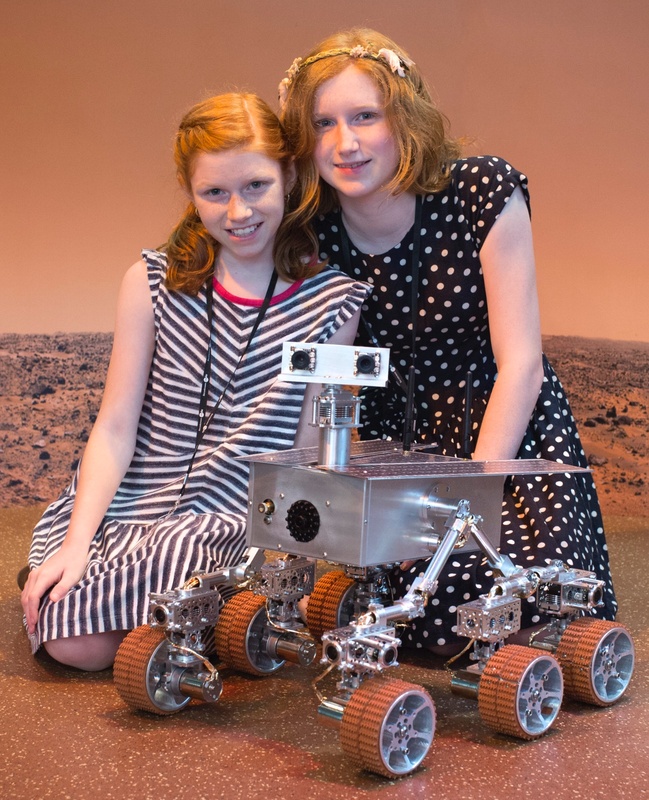 My sister and I have design and build fully-functional Mars Rovers and other custom robots for museums, science centers, and aerospace companies around the world. 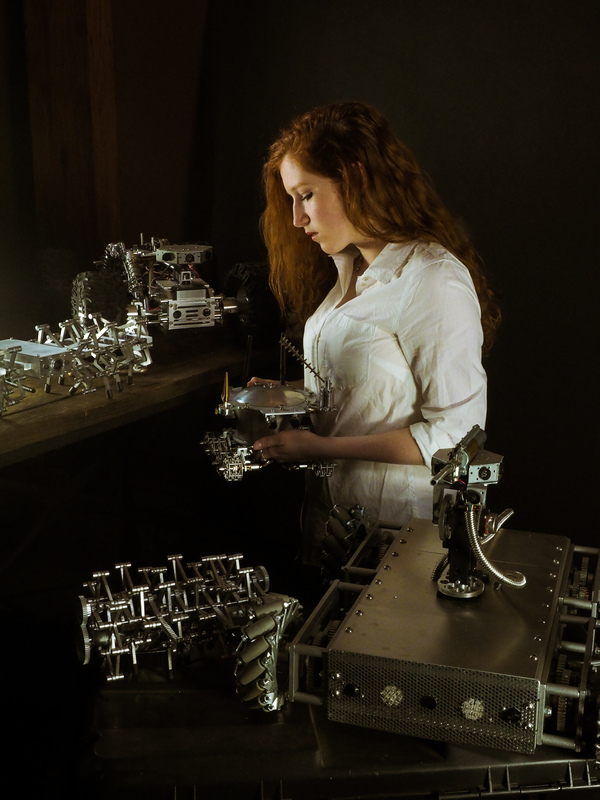 I started Beatty Robotics when I was 11 years old and my sister Genevieve was 9. When we started out, we didn’t know anything about building robots. We used YouTube, online tutorials, and various tech sites to learn how to solder wires, design a circuit, configure servos, machine metal parts, program micro controllers, and all the other skills we needed. Great work you are doing, girls. Congratulations! Awesome job ladies!!! Love to see girls interested in science and technology. I can’t wait to see what you come up with next! Keep up the great work! I have a 8 year old and I’m starting to think about how to get her involved in electronics & programming without pushing her into it. Do you have any general advice? Love what you girls are doing! I just found out my wife is pregnant, and now I can’t wait for my kid to get here so I can start learning all kinds of new awesomeness with them. I can only hope my kids are so inquisitive and curious — I think what you girls are doing is flat-out AWESOME. Can’t wait to see more! Hey, what you girls are doing is great. What an inspiration! I love that you start with curiousity and really explore it. What wonderful creations are made as a result! Camille and Genevieve, you girls rock! Keep asking questions, the results are amazing! I think you ought to get the department of defense to buy one of these modified to utilize .308 ammunition or even .22..
Great design and keep dreaming up more stuff! I am so proud of you, Beatty girls ! I am so proud of you, Beatty family ! wonderful work u ppls are doing here…i was in search of this kind of work..
MAY GOD BLESS BEATTY GIRLS. Great job! I hope my kids show the same interest as you girls. I teach robotics at Haywood Community College in Waynesville N.C. I loved your video. You girls are an inspiration to woman getting into technology. You are welcome to visit my lab at the High Technology Center anytime. I just heard about this and I am very excited. Being a scientist (turned accountant), it is great to see girls enjoying scientific discovery. Im pretty impressed about those projects you have been doing. Congratulations and keep going! Wonderful work! 🙂 Are you girls interested in helping us building a robot lawn mower? We are a few guys who developed a versatile/modular open-source ‘brain’ (Arduino-based) for a robot lawn mower, and we could really need some inspiration for a chassis from someone with CNC skills. Very impressive stuff, girls, keep building and good luck. Hello- saw your story on Yahoo today! Found your site through the nice write-up at Yahoo. I love the curiosity of the young ladies. I was a curious kid. Took apart clocks and things (didn’t have electronics) to see how they worked. Read voraciously. Got books and taught myself electronics in high school. Fast forward to today: I will soon retire as a transmitter engineer for UNC-TV. Great to see your projects are going so well! Good job! I saw you on FOX News! Great looking robots! Keep up the fanatastic job girls! The sky is the limit! I just discovered you girls in the current Popular Science Magazine. The article energized me. I think about the future of our country and our culture finding much that saddens me. I also find hope and inspiration in technology and talent in young minds like you girls. Really interesting projetcts! Would you be interested in taking on Robotics projects for private firms? I think your Aluminalis is a really excellent build! I don’t suppose you girls will be making an appearance at the NC Maker Faire or the Columbia, SC maker faire? Have you girls looked into soft robotics? McKibben air muscles might be fun! Maybe the cutest machinists ever. Good job! Always interesting to see what you girls are working on. Very impressive. Amazing, superb..Hats off ..to you both you girls for your achievement. A beatifull work you are doing. Congratulations to you. I hope that you have a great success. You are so young a very determinated. A example to others. Ps. Sorry my poor english. Camille- Thank you for coming and speaking to us at A-B Tech yesterday. The comments we received about your presentation indicate that everybody took lessons away from your story. Thank you to you for sharing the robots with us!